2003 Promise Prize Scholar, SUNY Buffalo Law School. JD 2005. MA 2015. Monique is an Administrative Law Judge with the NYS Division of Human Rights. After law school Monique worked extensively in family law as Senior Court Attorney and for the Family Court Bureau Legal Aid Society of Nassau County. With A deep commitment to law, people, church and community, she has many years of public and community service, and currently serves on the Board of Advisors for the Change Create Transform Foundation. 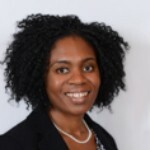 In 2015, Monique earned Master of Arts in Higher Education Administration at Stony Brook University and a BA in economics from Cornell University.